In the past year or so I'm starting to see more and more buyers both recreational and ski teams spend the money for digital engine control and monitoring. What I am referring to is ICON for Evinrude and SmartCraft for Mercury. The ICON System is available on any V-6 Evinrude while the SmartCraft is only available on Mercury Verado engines. 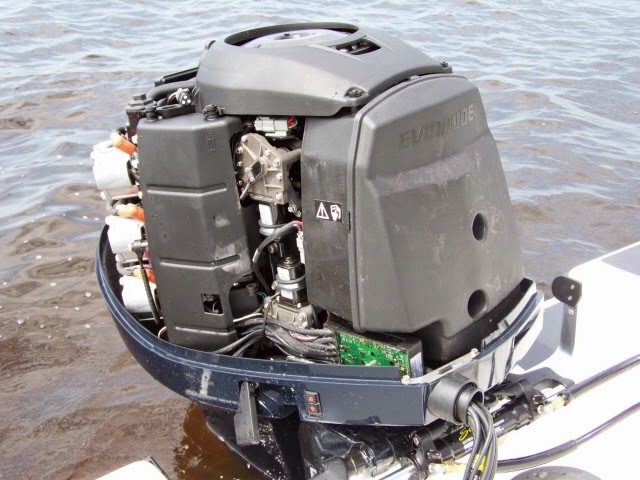 Evinrude V-6 motors are all two stroke motors while the Verado is a four stroke motor with super charger. DO NOT CONFUSE engine monitoring with engine control as both engine monitoring systems can be used with conventional cable controls and have just digital engine monitoring. Digital control means a computer cable with data signals are used to operate the shift and throttle of the engine or engines and not traditional mechanical cables for shift and throttle control. Digital controls are super smooth and give the ability to control motor speed more precisely than mechanical cables seem to be able to. Once you experience them it will be hard to go back to mechanical controls. Mechanical cables and controls do wear out and should be replaced over the years depending on use. Digital controls and cables should never need replacing. The flush mount recessed digital controls look very similar to mechanical controls but feel a whole lot different and take some getting used to. They cannot be interchanged between systems. Can you tell the difference in the two pictures below? The mechanical control is the top left one. Digital on the lower right. 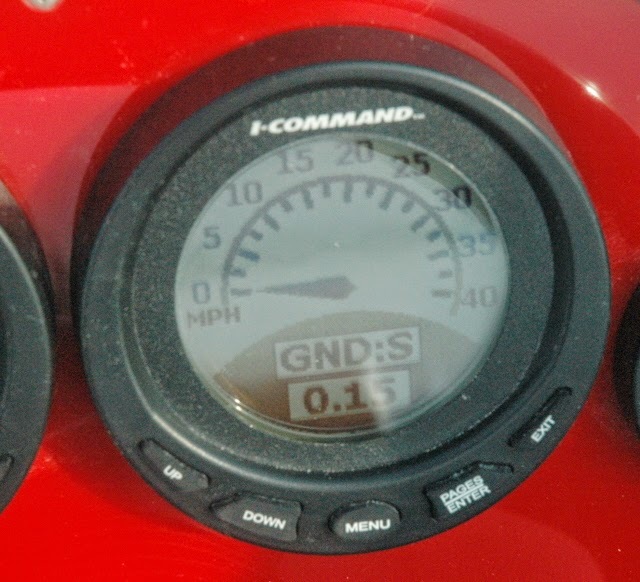 I can hardly remember a single Dyna-Ski that does not have a GPS Speedometer since we started offering it. 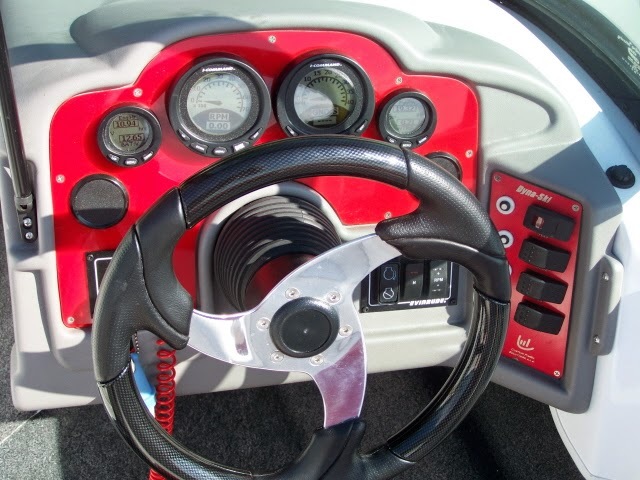 Livorsi was the first company to offer GPS Water Ski Speedometers and we put a fair number of their product on Dyna-Ski Boats over the years. 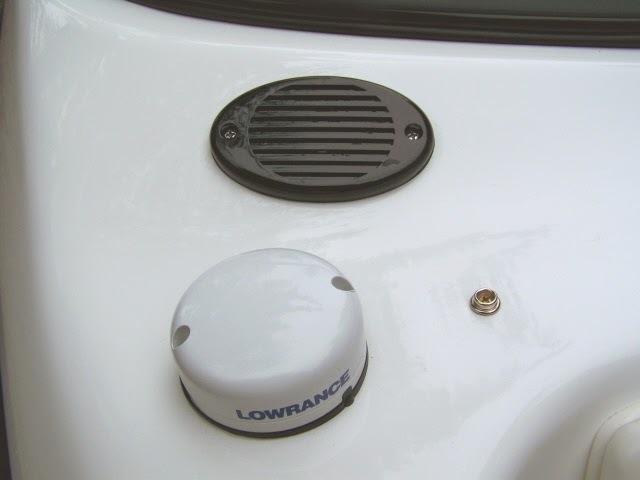 GPS systems on boats have a puck for speed pickup. Keep in mind that GPS read out is speed over ground and not water. The speed reading system is very similar to the ones is use on navigation systems in vehicles. 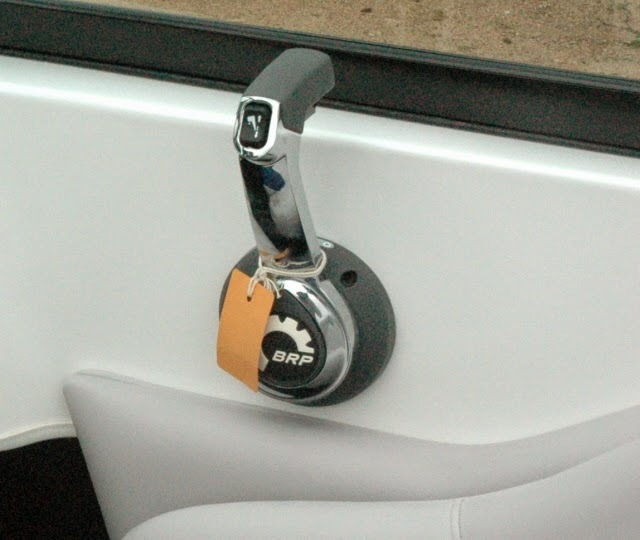 Pictured below is a puck and horn on a Dyna-Ski Open Bow along with a snap for the bow cover. Dyna-Ski built a triple Verado powered and SmartCraft digital controlled Dyna-Ski for the Hartwick Huskies way back in 2008. It had power assist hydraulic steering so the boat could be driven with one finger and speed changes on all three engines made with a thumb and two fingers. As far as I know this boat is still in use and they have reported zero problems to Dyna-Ski. 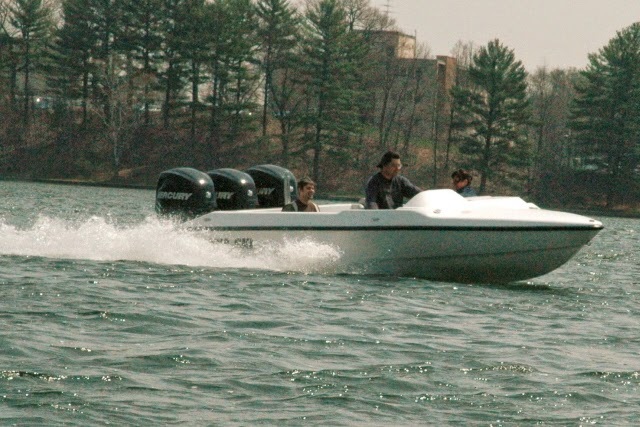 The Dyna-Ski boat below uses two levers to control three engines which is how Mercury and Evinrude systems currently work. 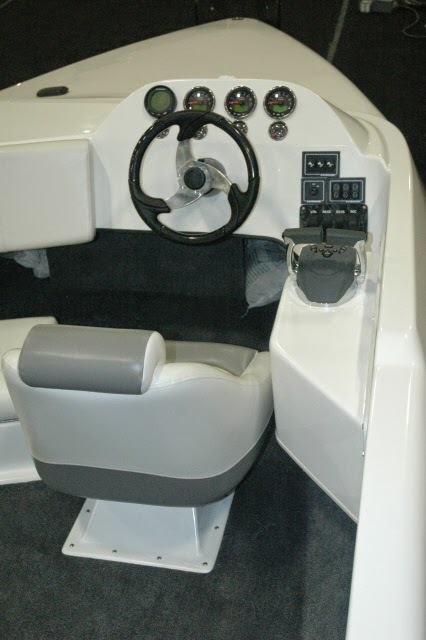 Notice the boat batteries are behind the passenger seat to help reduce the weight in the back of the triple motored boat and also help balance out the boat. Most ski team twins and all triples have ballast in the front of their Dyna-Ski boats. Some have a lot of ballast. 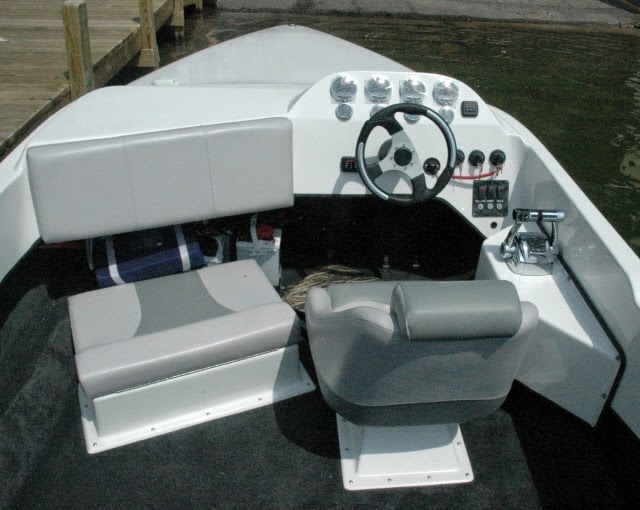 Dyna-Ski put one of the first ICON systems on a 20' Open Bow demo several years ago. It is an excellent system and people that tried it loved it. I'm thinking I will put ICON on my 1987 Hydrodyne which will spoil my son and wife forever I am afraid. I have redone and updated most everything on the boat over the years and there is information on this blog about the updates. With the Evinrude ICON system the motor end mechanical control parts are replaced with two electrical assemblies one for shifting and one for throttle. Each motor needs its own kit. This motor has hydraulic steering also. 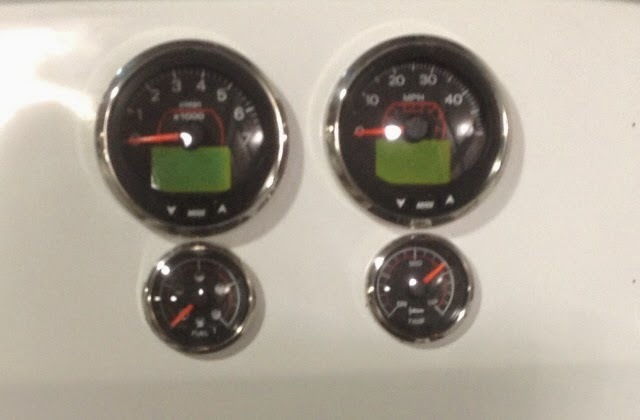 There have been a few updates over the years and Evinrude has added dedicated gauges to their product line. 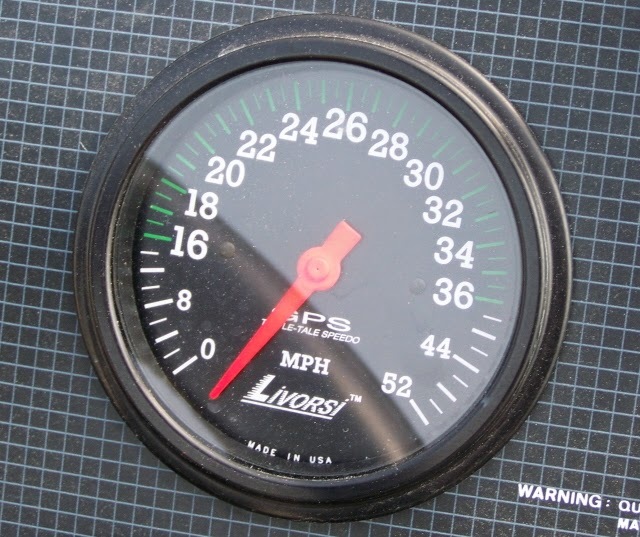 The dedicated gauges are nice however there are a few limitations with using some of them. The first gauges were 3" and 2" now they also offer much more expensive 5" gauges. Pictured below are the 3" and 2" dedicated gauges. the new ones cannot as they are single function generally. The original ones are still available and we have mixed and matched them for different customer needs when requested. If you have read this blog you have figured out my background is mainly Evinrude and I'm a two stroke or two cycle fan. Twin Lakes Marine is doing a Mercury Verado with digital controls for a customer so I am hoping to get more information and pictures of this Dyna-Ski in the near future. 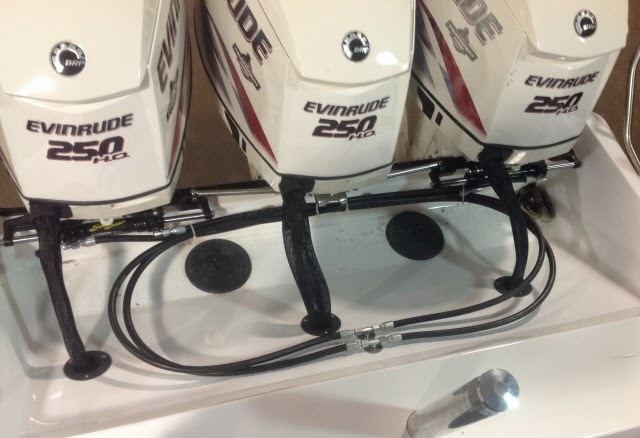 We are not Verado Certified as the demand for this product has been enough to spend the time and money to do it yet and we have the experienced folks at Twin Lakes Marine to handle our Mercury needs and now they are an Evinrude dealer as well. Dyna-Ski, Evinrude & Mercury so WIN WIN WIN! along with three 2" trim and one 2" fuel level gauge. 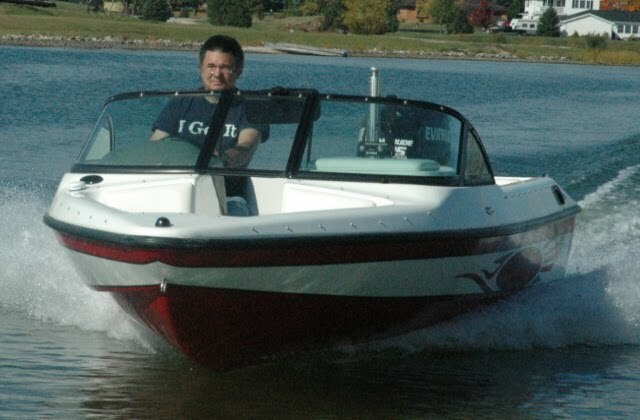 This Dyna-Ski 20' Closed Bow boat has it all including electric power assist hydraulic steering and a counter rotation unit on one of the three engines so the boat sits flatter and has a more even steering (less potential pulling to one side or boat twist). This all makes the Dyna-Ski boat super easy to drive and remember it has almost 800 HP! It makes for a neat and clean motor well also. Notice the outside motors have the hydraulic cylinders and the center motor is connected with tie bars. Digital controls available allow the driver to make very easy and very fine adjustments of motor speed! The digital controls don't allow the driver to slam the motor(s) into gear so gear cases cannot be abused. The mechanical cables associated with outboards will eventually be a thing of the past in many applications however the wide use of the mechanical systems in the past, coupled with the higher costs may keep cables and mechanical controls around for quite some time. More and more people are seeing the upsides and paying the extra money to have the benefits long term in certain applications. Digital controls are everywhere. Your vehicles have had them for many years so why not your boats . . . . . . .
*Please note that I mentioned about that one downside of the GPS digital readout speedometers is the digital speed reading in the hundredths of a mile per hour on the bottom of the display. I was teaching my son to drive this past summer. John was focused on maintaining the speed for his Swivel Skiing mother at a rock steady speed of 14 mph. He was constantly increasing and decreasing the throttle slightly causing the boat to speed up and slow down. I call it see-sawing the throttle. She was not happy. Once I convinced him that the speedometer was a guide and not to make changes unless he felt the boat speed change or saw the angle of her ski change he did much better. 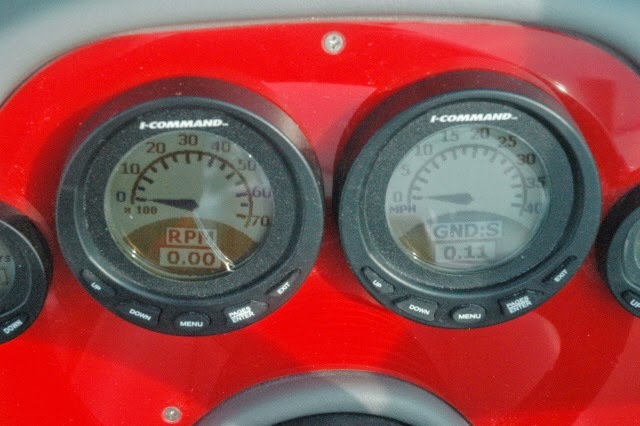 The old famous "standard" Air Guide Pitot tube Speedometers that every manufacturer used for many years on ski boats were slow to show speed changes so it made the boat seem easy to drive or hold steady at various speeds. The boats still are pretty steady! I could write a book trying to explain that the boat is not actually changing speeds and that the system that gives the readout is using a finer of measurement of speed than is needed. Not to mention that it is speed over ground and not water that is being shown on them. I hope this makes some sense as it is not the focus of this article. In the old family ski boat I have a pitot tube Air Guide and a GPS Speedometer on a lake that has lots of weeds in some places.